SSC CHSL Tier 2 Admit Card 2016 link is available at ssc.nic.in. 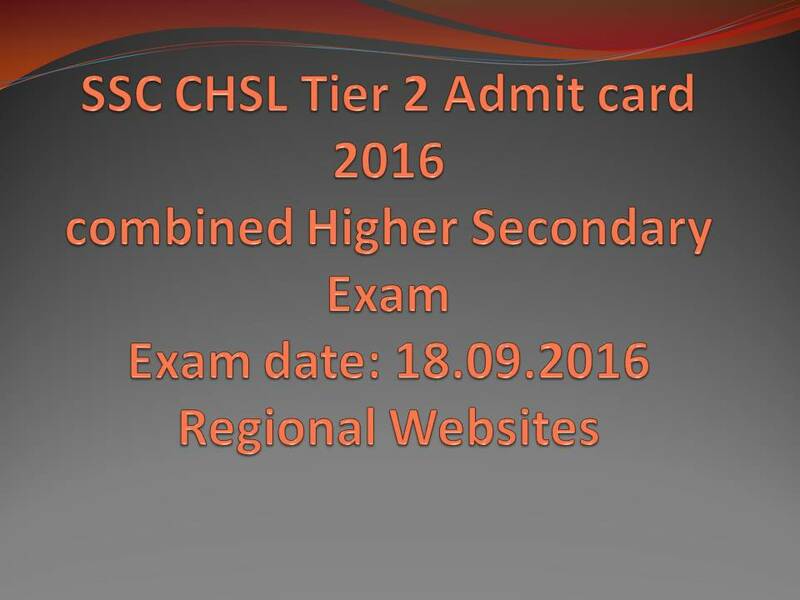 Visit the official website for more information about SSC CHSL Tier 2 Admit Card. SSC CHSL Tier 2 Admit Card 2016 link download: The SSC CHSL Tier 2 admit card 2016 are available in the official website. Aspirants can visit the official website to download their SSC CHSL Tier 2 Admit Card 2016. The Staff Selection had activated the link to download the SSC CHSL admit card of the tier 2 combined Higher Secondary Level examination that is going to be conducted onSep 18, 2016 for all regions. The commission had conducted the Combined Higher Secondary Level examination tier 1 exam on various dates in the months of Nov 2015 and declared the result of the same on July 29, 2016. The aspirants those who had qualified in Tier 1 exam can now download the call letters of Tier 2 exam from the commission’s website. Visit the official website and select your region. After selecting your region enter your date of birth and hall ticket number to download your admit card. After entering your details click on the download button to save your admit card.